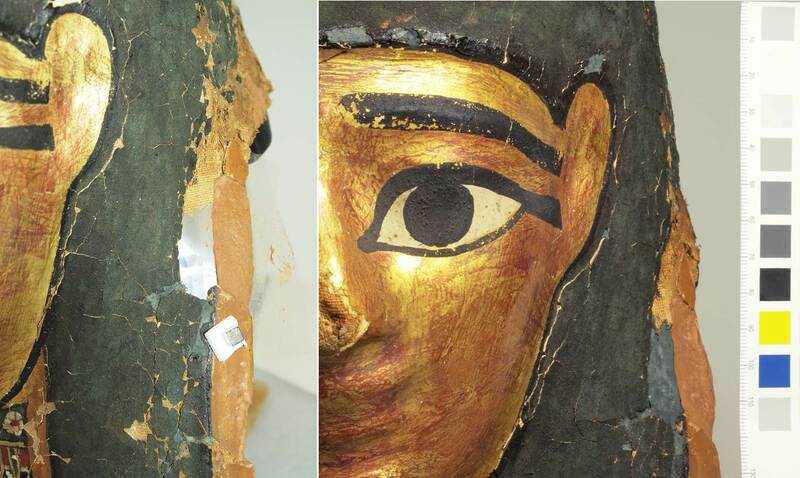 This is the final installment of the conservation treatment of Nefrina’s Funerary mask. The condition and stabilization of the interior have been discussed in previous posts. In this post, I will be talking about building the storage and display mount as well as stabilizing the exterior of the mask. 1. New mount construction: Once the interior structural issues were addressed, I made a new mount for the object. I carved Ethafoam, an inert polyethylene foam, to create a support for the top of the head, and used epoxy putty (the black material in the images below) to create a form-fitting rigid support. The clear plastic in the image below is cling film, which I used to keep the epoxy from bonding to the mask while it cured. The mount is in three separate detachable parts. Part 1 supports the top of the head and the face, part 2 supports the front and back panels of the mask, and part 3 is a stand to hold parts 1 and 2 during travel and storage. Parts 1 and 2 of the mount are supporting the mask at this moment while it is on display (along with a pole mount that has taken the place of part 3). Left: During treatment photo showing the construction of the top portion of the mount. Right: The completed mount. 2. Facing removal: Once I completed the mount and put it in place, I flipped the mask over again and started to remove the temporary facing of Japanese tissue. I removed the facing in sections and stabilized the exposed areas before moving on to a new area. I did this by brushing an area of facing with acetone, which solubilized the adhesive that had been used to place the facing, and then gently pulling the Japanese tissue back. 3. Re-shaping before tear repair: Some of the tears did not go through all of the linen layers, and so could not be treated from the interior. These tears had to be realigned and repaired from the front. As with the inside, I often had to humidify and re-shape an area before carrying out the repair. The images below show the tear in the forehead of the mask during reshaping. I used Teflon tape to bring the edges of the tear together. 4. Tear repair: I repaired the tears using paper pulp combined with methyl cellulose and powdered pigments. Before applying the wet pulp, I lined part of the areas with a thin sheet of dried paper pulp mixture to achieve an even fill. Left: Lining the area with dried paper pulp and methyl cellulose. Right: After filling with additional paper pulp/methyl cellulose mixture. 5. Edging: Many areas of the paint were adjacent to areas of loss and were cracked and cupped. I stabilized these areas by edging the paint with paper pulp combined with methyl cellulose and powdered pigments. 6. Loss Compensation: Large areas of loss on the edges of the mask also had to be filled for the mask to be structurally stable. I filled the areas of loss by applying pigmented paper pulp mixed with methyl cellulose across the areas of loss using a backing support of silicone-coated Mylar. The coating on the Mylar allows it to be removed once the paper pulp mixture had dried. Left: Detail during loss compensation. The square rare earth magnet at the bottom of the image was used to align the Mylar along the contours of the mask. Right: After the fill was complete and had dried. 7. In-painting: Although I had pre-toned the fill material, the fills still needed just a bit of in-painting to adjust the color so that it would blend in better with the mask. Left: Tear on the head after treatment. Right: Area of loss on the side of the mask after treatment. All of this work allowed Nefrina’s Funerary mask to travel for exhibition in the Reading Public Museum, and to be exhibited here at the museum, In the Artifact Lab – visit us to take a closer look at the mask for yourself, and to see several other objects that have recently been conserved. 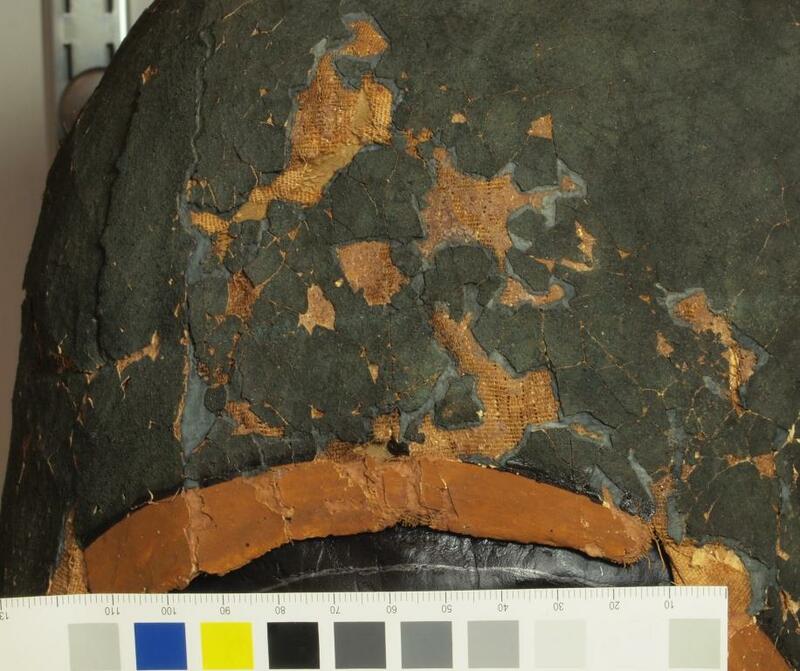 As promised in the previous posting on the condition of Nefrina’s Funerary Mask, here is the next installment on its conservation treatment. 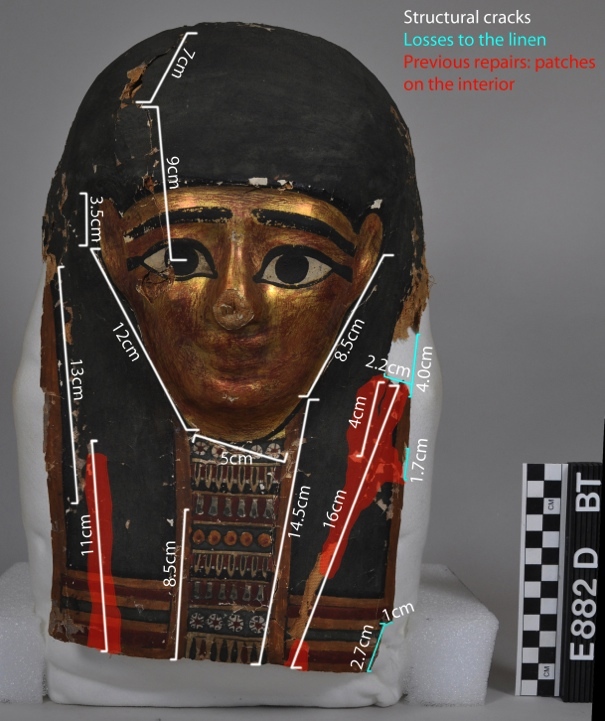 Because this treatment was so involved, in this post I am just going to talk about the temporary stabilization of the exterior and the repairs on the interior of the mask. 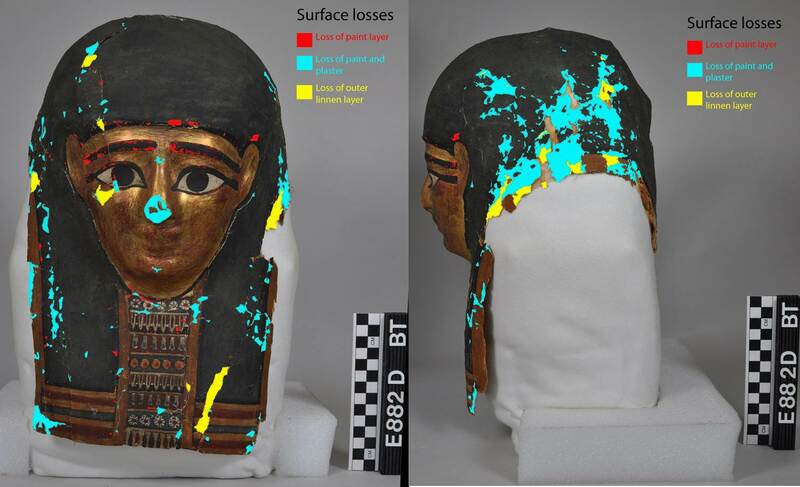 1) Facing: Facings are often used by conservators to temporarily stabilize surfaces so that an object can be handled and other structural problems can be addressed first. 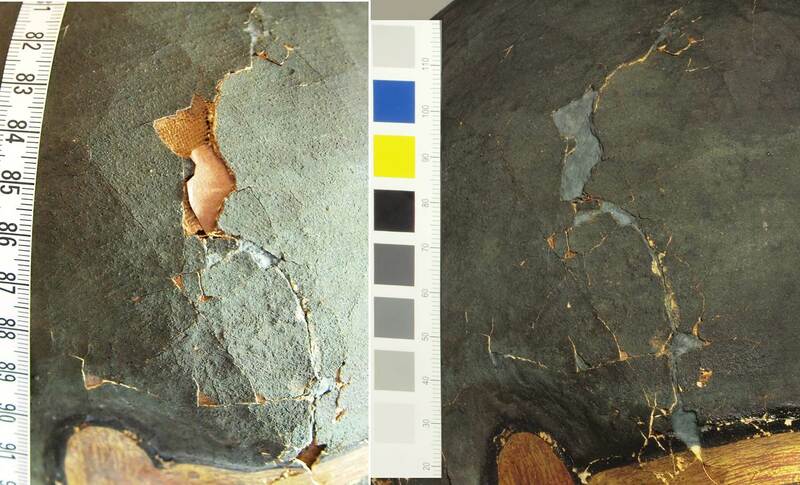 In this case, the flaking and cracked paint on the mask had to be temporarily stabilized before the tears and deformed areas could be repaired. I used Japanese tissue that I adhered onto the exterior of the surface so that the object could be safely handled and the interior examined. the front of the mask after facing was applied (it may look like clear tape but it’s not). 2) I made a temporary support to hold the mask safely so I could flip it over, remove the storage mount made in 1993, and examination the interior. 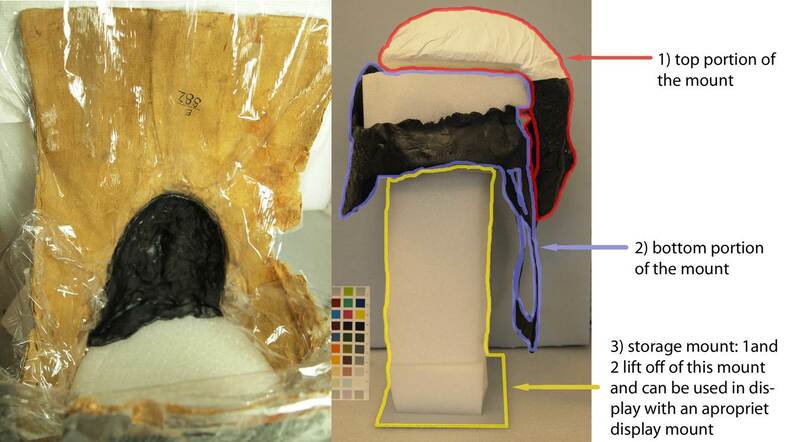 3) Removal of the previous treatment: In 1993 patches of spun-bonded polyester had been adhered onto the interior. I had to remove some of these so that the object could be reshaped and the tears aligned. Left – detail of a spun bonded patch. Right – detail of the same area after removal of the spun bonded polyester patch. 4) Humidification: I humidified and reshaped distorted and crushed areas using localized humidification with our Preservation Pencil. The preservation pencil allowed me to apply warm moisture to discrete areas of the object (you can see the stream of moisture coming through the orange nozzle in the picture below). Once an area is humidified, it becomes soft and pliable. The humidified area is reshaped by supporting it with ethafoam inserts or with rare earth magnets and ethafoam padding. 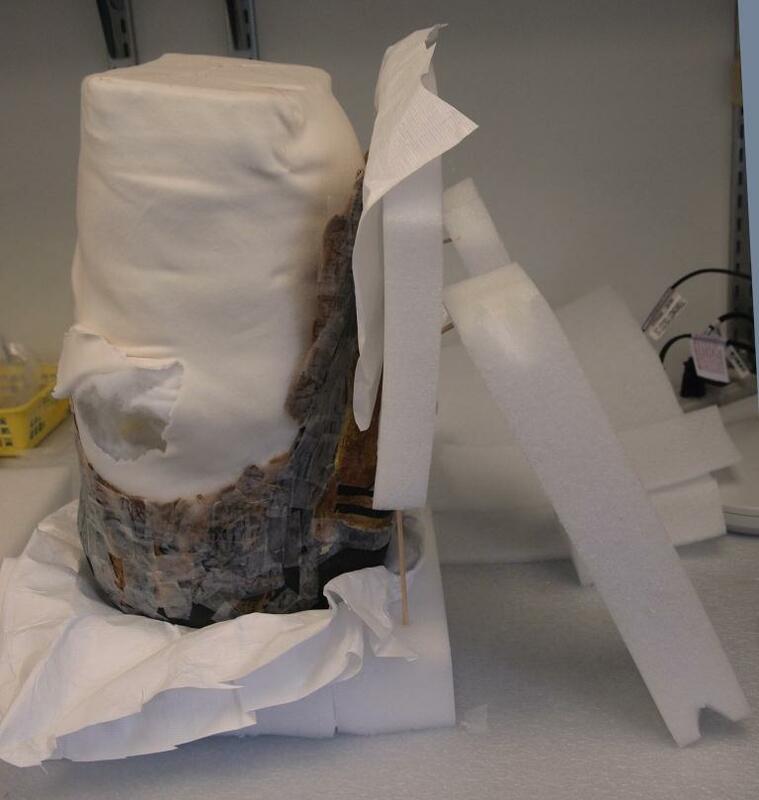 This support is critical to maintain the correct shape as the humidified area losses moisture and stiffens again. 5) The tears were repaired from the inside using Japanese tissue patches toned with acrylic paint and adhered using methyl cellulose. Once the interior problems were addressed, I could return to the instability on the exterior parts of the mask, but you will have to wait for my next post to hear about that! 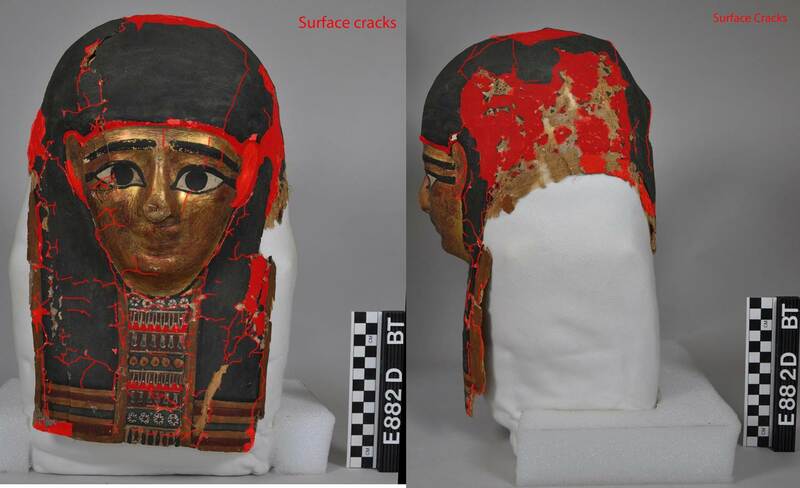 Now that Nefrina is on display, I thought it might be helpful to discuss the condition of the mask as well as the treatment it underwent in 2011. 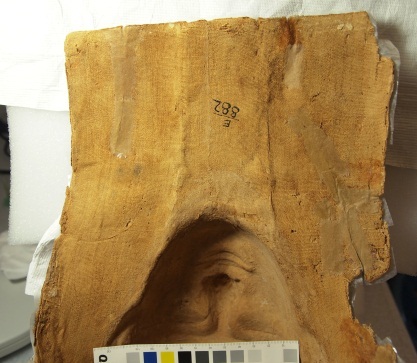 Just as a bit of background, the mask has been in the Penn Museum’s collection since 1893 and was recently on display at the Reading Public Museum in Reading, PA. Below you can see the mask before treatment. When the mask arrived to the conservation lab in 2011, it was a return visit. 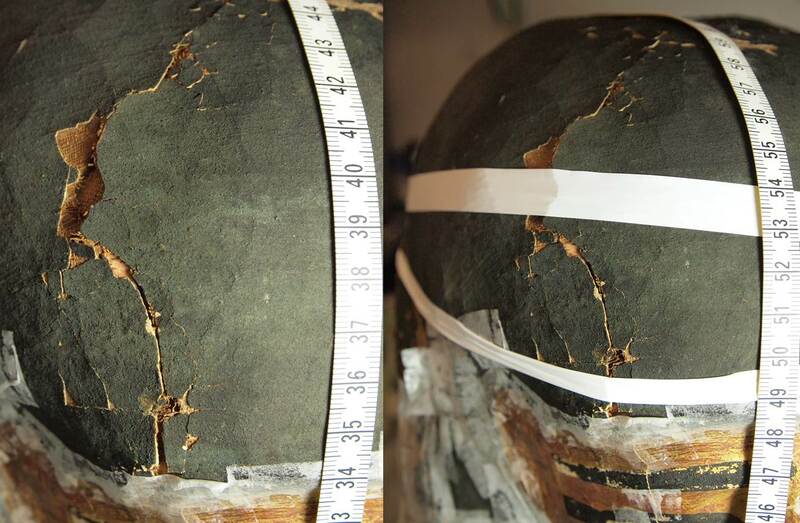 In 1993, the mask was stabilized for in-house photography, but this treatment did not address the many structural and surface issues that really needed to be taken care of before the mask could travel to Reading or be displayed. 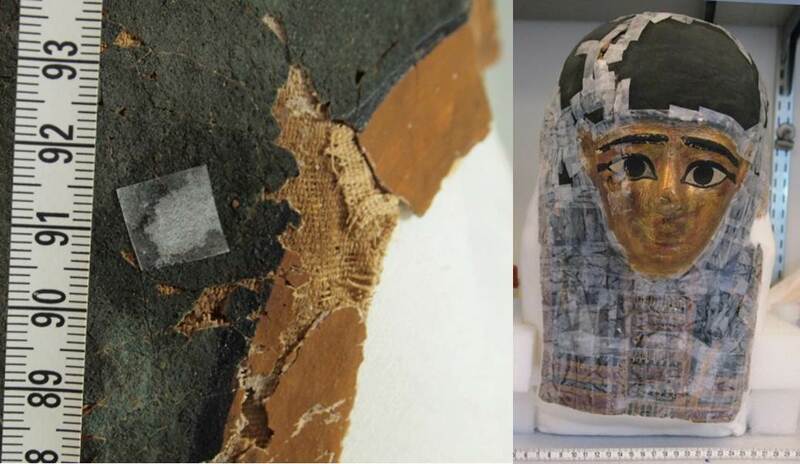 As was mentioned in the previous posting about Nefrina’s funerary mask, it is made of cartonnage which is a composite material consisting of layers of linen and papyrus impregnated with glue that has been covered with plaster and painted. This type of material is prone to damage because of the differences in properties of the layers: the linen is flexible and the paint and gesso layers are rigid and brittle. As a result, when the mask is moved or stored unsupported the textile will bend causing damage to the gesso and paint layers. 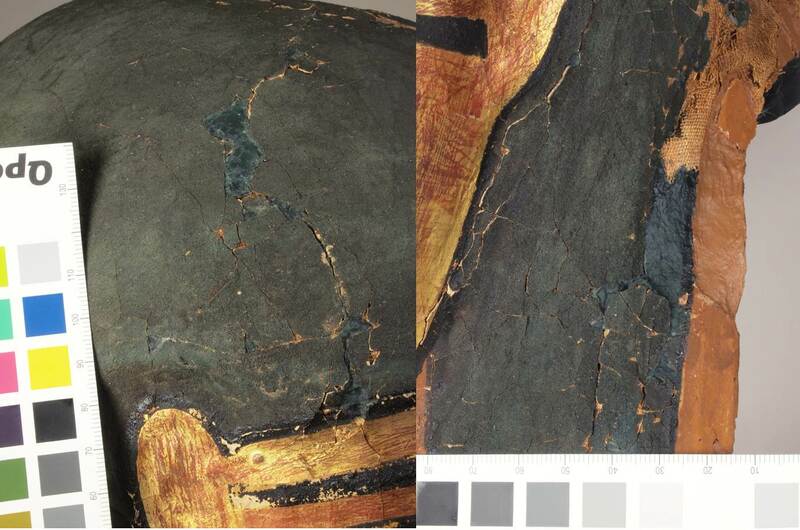 As you can see the cracking and loss to the paint is worse on the sides; this is likely because prior to 1993 the mask had no storage mount and probably rested flat on its back with the face pointing up. This position would have allowed the linen to flex and bend on the sides causing the paint to crack and detach from the surface. Areas on the front and back of the mask were also distorted and dented, also likely as a result of lack of proper support. The goals of the treatment in 2011 were to stabilize and realign the tears, compensate structural losses, and stabilize cracks, which will be discussed in an upcoming post. All of these artifacts are displayed with labels explaining their conservation “story”. 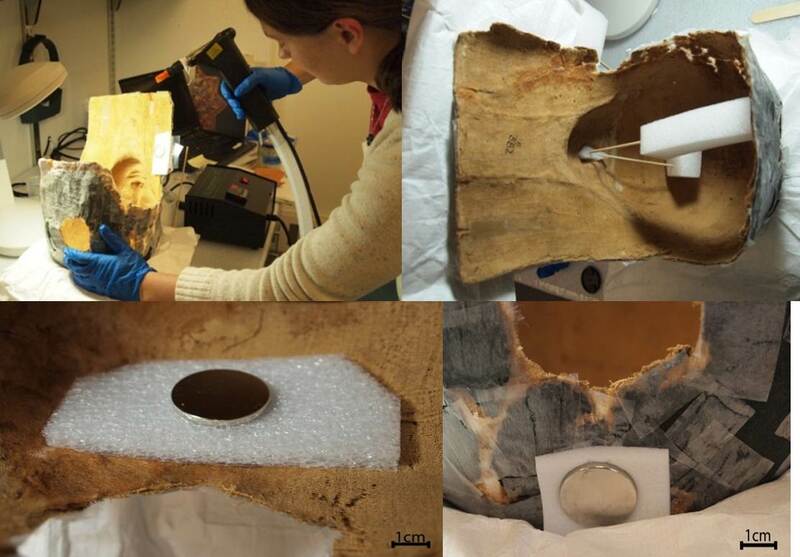 In addition, we have a binder available in the exhibit space that includes the conservation treatment reports and images for each of these artifacts. These reports contain detailed descriptions of the materials and the condition of these artifacts, and of the techniques and materials used to conserve them. Of course, we also have information about these pieces here on our blog, and later this week we will post more information about the process of conserving Nefrina’s mummy mask. 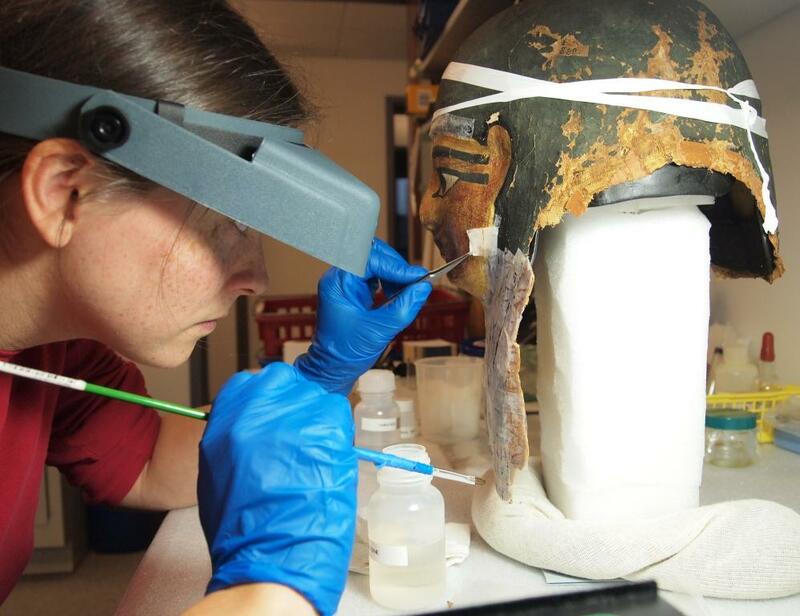 In 2011 I had the privilege to work on the mummy mask shown below, and I am excited that it will soon be on display In the Artifact Lab! Since this mask will be a new addition to the gallery, it seems fitting the mask have an introduction to the blog as well. 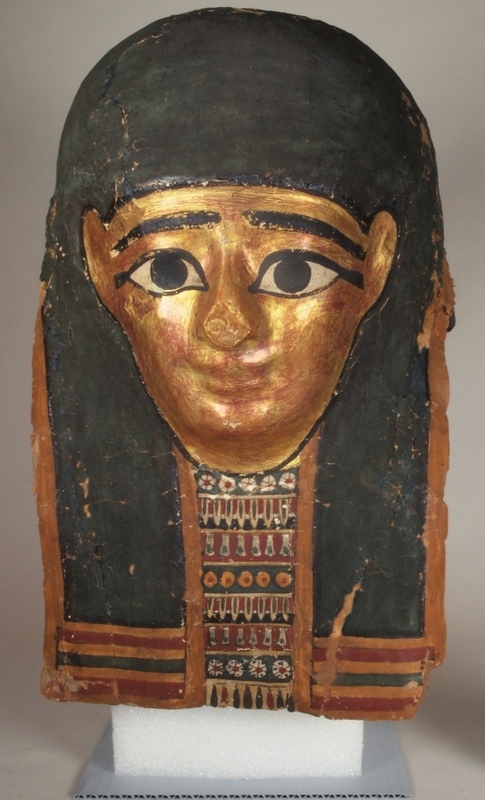 The face of this mask has a slightly different preparation from the rest of the head, as it has gold leaf and required a predatory layer called red bole. Bole is a fine clay ground layer that is applied before putting down gold leaf as it creates a richer color and provides a good surface for burnishing the gold. Once finished, the mask would have been removed from the core and be ready for use. This mask belonged to a woman from the Ptolemaic period (300-30 BC) named Nefer-iin-e (Nefrina). 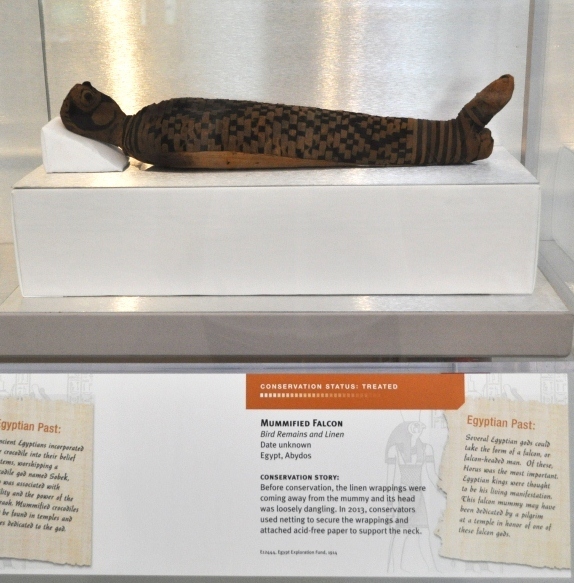 Nefrina’s mummy and coffin are on display at the Reading Public Museum, just about an hour from Philadelphia in Reading, PA, and it is from the translation of the text on her coffin that her name is known in addition to information about her parents. Her father, Irthrrw (Irethorrou) and mother, Ir(ty)-r-w (Irty-rou), both served in the temple for the Egyptian fertility god Min. 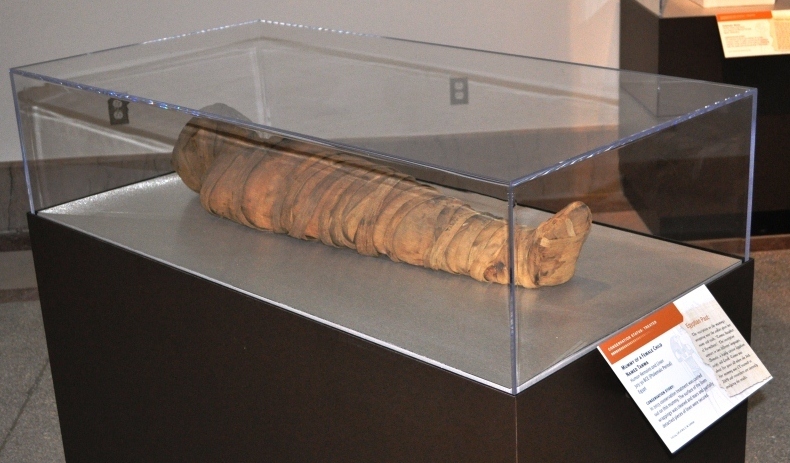 In 2012 the mask was reunited with the coffin and mummy at the Reading Public Museum for the first time in 82 years as part of an exhibit called Nefrina’s World. 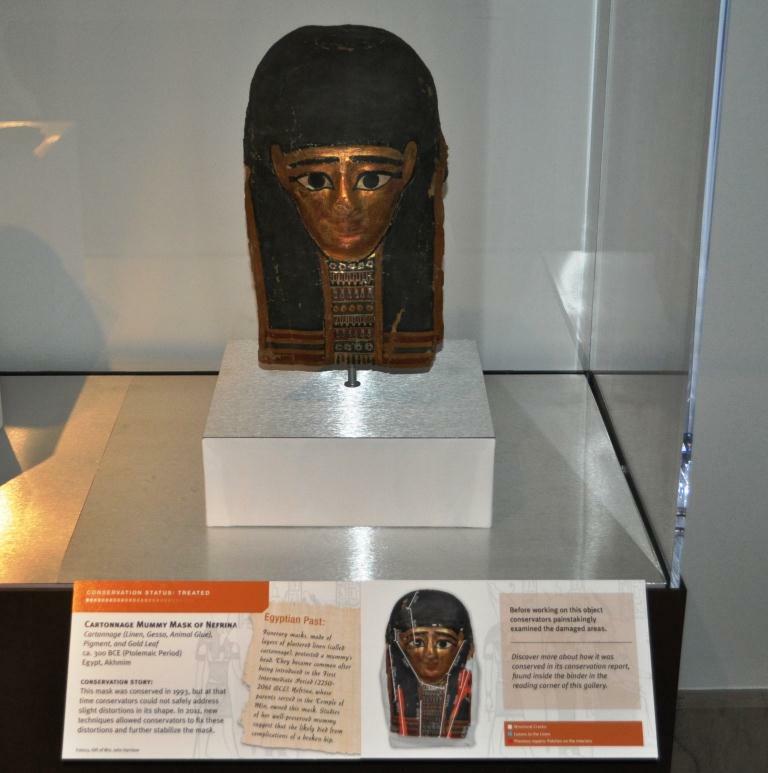 Now that the mask is back at the Penn Museum, we are excited that it is going to be on display here too! Once it is in the gallery we will follow up with a post about it’s conservation treatment.